I know what I’m like with these Chinese imports trying hard to be Apple products, so this time, instead of just getting really annoyed with what comes out of the box, I immediately installed Nova Launcher Prime and uninstalled all the bloat I could - and Force Stopped/Disabled most of the rest. This way, I wasn’t able to write off the Honor 10 before I had even started! The added apps and services (some of which can be uninstalled) are numerous. Mostly games, but also completely unnecessary Honor replications of Google apps and ‘enhancements’ to the Android experience. They are all merely an irritation and one can only reflect on the price of the device whilst ploughing through dealing with it all, resignedly feeling sorry for the average user who wouldn’t have a clue how to, nor why, and be sucked into using Honor apps and services, letting the company have all their data as well as Google. Before I get to the meat, I have to mention, as I did in my Huawei Mate 10 Pro review (https://goo.gl/E78gLM), the Huawei/Honor approach to Notifications and how horribly confusing and (near) broken it is. The problem is that H/H lump together the same Notification tone for Email, Calendar and Messages, then rely on individual apps (which are outside the control of the system) to override that. Which some can’t. Google Plus is one. You can’t assign a Notification tone to G+ which is not the default one chosen for all three PIM services. So the option is None, Vibrate only or to accept the same tone assigned to SMS. Same is true of Calendar. GMail can be changed, but the switches are buried very deep in Settings in the app. I guess H/H would argue that it’s up to Devs to write that into their apps. I argue that with Vanilla Android, it’s just much simpler. Don’t lump those three PIM services together - let them fall outside the central settings. Why would they do this! Maybe it’s another Apple emulation - I don't know iOS well enough to say. So I have my SMS tone assigned now in ‘Email, Messages and Calendar’ but switched in GMail and Calendar. The system thinks it’s grouped and global, but it’s not. If people in this Manor are going to struggle to sort this out, what chance a NorMob! Stop Press: Incoming Notification, which I thought was an SMS, but no - it’s a message from the Files Go app offering to clean up some files it thinks is taking up space. So once assigned a ‘global’ default Notification tone, you have to go through every app and switch them all off. Pathetic Honor - fix it. Anyway, now that’s out of the way - I told you I was going to not let it annoy me(!) - we can get back to the device itself and what it’s got going for it. Physically, it’s an attempt at the shape of an iPhone, clearly - which you could say is not a bad thing as it’s sleek, stylish, smooth and nice to hold in the hand. It has a reflective coating on the back, which is really quite pretty (I have the blue one here) but is very slippery. Good job they thought to put in a clear TPU case in the box, which actually is very good, very clear and very grippy. The screen is bright and vibrant, colourful and has good viewing angles. The Colour (spelt in UK English!) can be shifted by the user into Vibrant, which makes a little bit of difference to punch and temperature is adjustable in infinite steps, should you want to emulate an LG blue-cast, for example! The resolution of the screen can be manually switched from 1080p to 720p to save battery and, for these old eyes, it seems to make little difference! There’s some smart face recognition stuff going on here, too, which I’ll cover now. There’s a setting to switch the orientation of the screen into portrait or landscape depending on how it detects your face is looking at it. However, I can’t get that to work - unlike the Face Unlock feature, which works incredibly well. Glasses on or not, all you have to do is lift the phone up to look at it, by the time it’s in front of you it’s unlocked. I remember this from the Mate 10 Pro being just as good. Clearly something they’ve done very well at H/H. However, you can’t get rid of that lockscreen wallpaper as there’s nothing in Settings to turn it off and go straight into homescreens, from what I can find. However, it only requires a swipe-up to get going. It’s a shame that there’s no ‘glance’ screen whatsoever, nor even DTTW, but there is the quick-lift option. The bezels top, left and right are tiny with a more generous ‘chin’ encapsulating an ‘ultrasonic’ fingerprint scanner. This is no ordinary fingerprint scanner though! It’s embedded under the glass and is completely smooth to the touch. It’s ‘pill’ shaped and functions like any other scanner except that, in my testing here, it’s slower and needs a firmer, longer press. Waking the screen from off is much quicker with face unlock. The Navigation controls give the user a number of options, including the swipe-use of the fingerprint scanner, getting the on-screen controls out of the way. Quick-tap for Back, long-press for Home, left-swipe for Recents and up-swipe for Google Assistant. 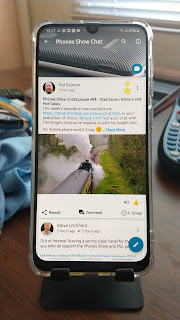 There’s a similar setting available which plonks a ‘tube’ on the screen instead of the buttons, which does the same thing as above, but being on-screen obviously takes space - but is in keeping with Android P navigation control. There are additionally Settings upon Settings for all sorts of stuff that you wouldn’t get elsewhere, so a tinkerer’s delight. However, H/H have horribly over-complicated access to where you want to be by burying settings - that with a Vanilla implementation of Android would be right in your face. Take Screen On Time since last charge. Tap Settings, Battery, Battery Usage, Hardware, Screen - then eventually you get the figure in hours/mins! That’s just one example - and logical Settings Search executions don’t offer that result. And that’s just one example. It’s littered with layers and layers of stuff like that which the average user would, no doubt, never see. Likewise, deals done with Amazon so that you can point the device at an item and the Amazon Assistant app, which has to be installed, will take you off to buy one! It’s just all so complicated. Whilst we’re here, there’s all sorts of other gesture control items, motion control (which makes Motorola’s few items look like a poor cousin!) of all sorts of settings from 3-finger-swipe for screenshot to split-screen gesture, ‘knuckle drawing’ to launch individual apps by drawing letters and much more. There’s a scheduled power off/on which means you can set the phone, for example, to shut down at 1am and turn back on at 7am, for those who can’t be bothered with DND settings, I guess. There’s Wifi+ to switch off as soon as you can, as it’s just complicated. Again, I noted this with the M10P, it switches between wifi and cellular for no apparent reason and is eating data instead of using wifi. It just doesn’t work properly! But who’s going to know where to find that and turn it off! There’s a ‘Log in with Huawei ID’ nag-line at the top of Settings, unless you give your soul to H/H, letting them know all about you. Let’s get back to the hardware and report that the device is running with a top-notch Kirin 970 chipset and an ample 4GB RAM. A lot of the above, and Launcher intricacies are down to EMUI 8.1 which it seems they’ve badged to be in keeping with Android 8.1 Oreo, also on board. June 2018 Google Security Update is present and in terms of function and speed across the UI/switching it seems absolutely fine, fast and clean. There’s 128GB of built-in storage and (unlike the Honor View 10) no additional microSD Card slot. But, actually, I think that’s enough for 98% of users these days. I have a slot in my Nokia 8 and 128GB - and never use a card. The phone is made from glass back/front with an aluminium frame and is roughly the same size as the Nokia 8 but a little less wide, with that 18:9 thing going on. Set to full brightness, the two devices seem very close - which is praise indeed as up to now the 8 seemed to hold the LCD crown. There’s no protection rating from the elements. Physically, Honor have created a very nice device, iPhone clone or not, which is pleasing to use. The 3400mAh battery is fast charging, capable of a 50% charge in 24 minutes. I charged it today when there was 30% left and checked it an hour later to find it was 100% using a QC4+ charger which came with my Razer Phone. There’s no Qi charging. The device has a USB-C charging/data port which seems to work well and quickly as I was copying over my music/video from a Windows 10 computer. There’s also an infrared port. Do people actually use those?! The battery seems to hold up very well for a day or a bit more of my general usage, so nothing like the bigger units, but certainly no slouch. As usual, I’m going to point you at The Phones Show with +Steve Litchfield for an appraisal (https://goo.gl/JnWHNG) of the camera capability as he covers it closely. I would say that I have found the camera to be more than adequate, lots of settings to play with, the Portrait Mode seems to be no worse than others. The close-focus is very good and EIS for low-light is facilitative. There’s an Aperture Mode which lets you choose wide settings, much like a ‘real’ camera using Aperture Priority Mode, which is super. 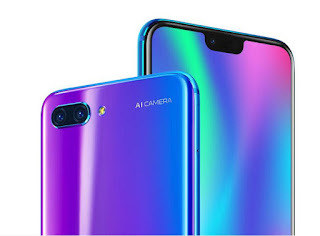 There’s no OIS but with the clever software thing going on, it offsets that to some degree (though not to anything like the extent of the Huawei P20 Pro). There are 2 cameras to enable some of that shenanigans including 2x ‘hybrid’ zoom, so not really optical, but it seems to work fine for my uses. The AI Camera, emblazoned across the back, recognises scenes and adjusts the camera’s settings to get the best shot. I’ll point you back to my M10P review, above, where I covered all this AI stuff more fully - and Steve’s video. Cameras are 16MP f1.8 and 24MP f1.8 Mono. I really like the Mono thing. Very artistic! The Selfie Cam is a 24MP f2 unit. I can find nothing to complain about with the camera, like I can with the software shambles, and it seems to serve perfectly well. The single bottom-firing mono loudspeaker seems alright. It’s a typical mid-price device speaker which will win no awards but which is perfectly usable in a quiet’ish room for most uses. No good for using in a car with a window open, nor at a party or BBQ. Personal use only. It’s not tinny, but it has no richness or great volume either. Very middle-of-the-road and average. The bigger problem is with the options to tweak the sound. Firstly, H/H have stripped out the equaliser from Google Play Music, so there’s no way to even try to change the speaker’s sound. There’s a Huawei Music app, in which access to any equalisation is only available via the Histen sub-app and then only using headphones. Again, no control for any sound from the speaker. The only way I found to adjust the sound from the speaker was by using VLC at least for my downloaded media, which has an equaliser. Not that it helped much! Some will be pleased to hear that the 10 has a 3.5mm audio-out socket and an in-built 32-bit DAC which I have tested with my usual AKG headphones and indeed it does sound fabulous! You can then get to Histen and start playing with the sound, including 3D surround options and tweaks for some specific headsets. The resulting sound is immersive and enjoyable. The Honor 10 is up against some tough competition in this £300-£400 price bracket. Offerings from pretty much all of the manufacturers, each with pros and cons to be considered. Some of them, like this, littered with software infusion and bloatware, some clean and pure Android. Some with useful additions, many with none but solid core performance. The 10 does hold its head up in the company there but for me, it’s completely spoilt by the EMUI layers upon layers of settings upon settings, complicating and confusing users for limited benefit. Physically it is a nice device and the screen is pure, bright and clear. Just a shame really that they’ve not made a Vanilla version, maybe with AndroidOne. Now that would be a peach!